While I have a Benchcrafted end vise on my workbench, I still have a soft spot in my heart for homebrew wagon vises. I started with a lame homemade wagon vise I made from a veneer press screw. Then I made a better one using a tail vise screw on my Nicholson workbench. Then I “perfected” that one by reworking it a bit – a story I still need to write up for the blog some day. But last week I saw Will Myers’ homemade wagon vise. His is better. He put the wagon vise on a near copy of a portable Moravian workbench in the collection at Old Salem in Winston-Salem, N.C. I wrote about this bench here. The original Moravian bench didn’t have a tail vise, so Myers concocted his own using a left-hand-thread Acme rod, some nuts, pipe and other assorted bits he welded together. It’s remarkably simple and works remarkably well. He brought his bench by The Woodwright’s School last Thursday for the students to examine and use for the afternoon while he settled up some business with Ed Lebetkin in the tool store upstairs. The bench itself is fantastic, built using common or reclaimed materials, yet with a furniture-maker’s eye and hand. The wood selection and joinery were superb. I’m not going to yammer much about the bench because Will has done this for me by publishing an extensive article on its construction – including the making of the wagon vise – at WKFineTools.com. Check out the entire article here. What a handsome bench and a nicely written and descriptive article. Seems like an extremely practical option for those of us searching for a work surface that offers portability without sacrificing the benefits we have grown accustomed to with our Roubos. Class in 2013? Why not build a portable Roubo like Kari did at The Village Carpenter? See here for more: http://villagecarpenter.blogspot.com/2012/04/roubo-finished.html . She has also posted some commentary about how it’s faired after a few trips. Thanks so much for sharing this. It’s just what I need…being a puny old woman. I love this design. So many workbenches, though wonderfully built and designed, become rather proprietary by fashion and size. This design has what you need, yet is simple, and is moderately transportable by intent. Thanks for the links about it. Wow…this is the first bench I have seen that really makes me consider something other than the Roubo style. My intuition is that any stability issues brought about by the knockdown design would be offset quite a bit by the angled base (anyone who would like to contradict me on this, please feel free). This appeals to me, since I am planning on moving within the next few years, and don’t really look forward to dealing with a monolithic behemoth (in any other situation than moving it, though, it’s ideal). It’s darn purty, too. This is a great bench for a Florida woodworker, given how our houses are built of CBS – concrete-block-stucco. Our garages serve multiple duties and we don ‘t have coat closets. Something that breaks down or folds up is ideal. B, I feel compelled to warn you that, as far as I know, the tusk tenon is not great for frequent knock-downs. SInce the wedge and mortise would be deformed a little each time you did it, it wouldn’t be long before you would need to make new wedges. Of course, if you’re ok with that, then have at it. However, I know these were also used a lot in the old days with trestle tables, which presumably were disassembled quite often, but they also didn’t get put under the stress that a workbench would. But maybe I’m full of it. Who knows. You ‘re not full of it. I ‘m glad you brought that up. We could go somewhat modern with metal knockdown hardware. Besides, the original probably had no idea their benches were going prime time in a mus eum. And I ‘m not building a bench thinking it will make it into the Smithsonian. I just push the wedges in by hand, the low angle on the wedges pulls it up tight. I have disassembled/assembled the bench about dozen times, I cant’ see any wear on the wedges or tennons yet. If down the road you did have to make new wedges it only takes about 30min to make them. I can’t seem to reply to your comment, Will, so I’ll just put it here–thanks for the info. And that is really a nice piece of work. Honestly, I have serious bench envy going on here. oops, guess I did it right after all. Great bench and write up Will. I must say that the portable bench is one of my favorite ones from our collection. It is not too wide or overly complicated. I do like the adaptation of placement of the leg vise that. It seems that it would greatly improve the ergonomics of the bench. I find that I often want a little more space between the plane stop and the leg vise as it is now set up. I was originally nervous about tusk tenons, but after working in the shop and seeing the bench get taken apart several time a year for the last 15 or so year and not have any problems, my confidence in them has grown. Thanks Jerome…..I had noticed the vise on the original was farther to the left than the one at Single Brothers house, after talking to you earlier this year I decided to make this one like the original. Your input on the vise is much appreciated! For those of you who want to make your own tail vise per Wills instructions, you can find 5/8 left-hand acme thread rod and matching nuts for under $30 at McMaster-Carr. They also have the Bench-Crafted style handles for about $40. Chris, regarding tail vises and Nicholson style benches…once you pound down the dogs, tell me about knocking them back up while reaching around the 10″-12″ front apron? 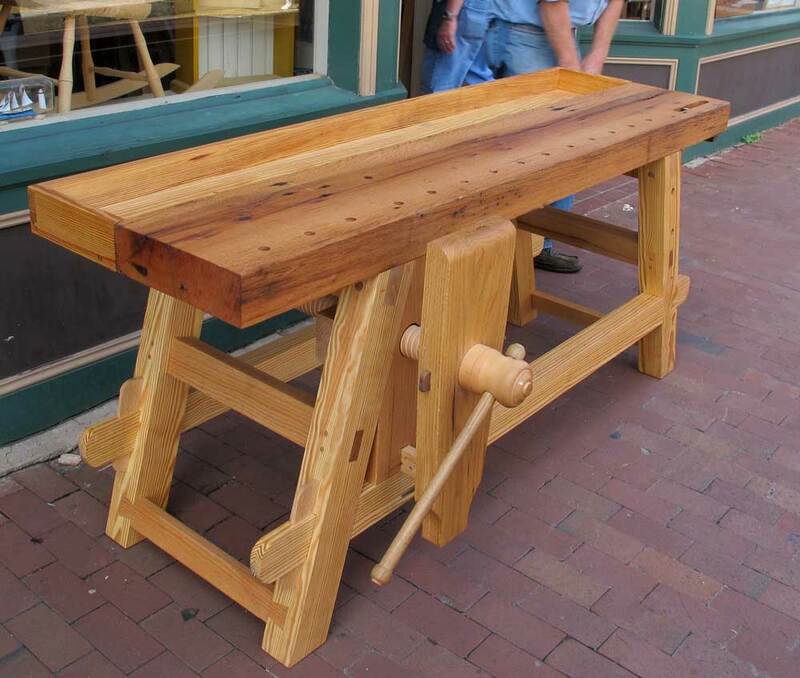 I’ve been wanting to build an English style bench like those in Williamsburg but with an end vise and have been pondering this issue. Nicholson’s original bench does not have a tail vise or dogs. It’s not a ton of fun to push the dogs up. But it’s also not the end of the world. I have long monkey arms, which helps. Or you could make super-long dogs. Dare I say foot-longs? Or more?